How would you like to own a portfolio that is steered by analysts at a firm that is well-established and respected within the investment industry – analysts who monitor (on a regular basis) company developments and value and make portfolio adjustments as needed. More importantly, the most distinctive characteristic within this portfolio is “competitive advantage”! Competitive advantage: something that (according to Charles Darwin) drove the evolution of all earthly life through “survival of the fittest”. More germane to our own daily lives, don’t we savor having a “competitive advantage” over someone else on the golf course (high handicap), fantasy football (having Aaron Rodgers, Calvin Johnson, Adrian Peterson, Arian Foster, Matt Forte, and Brandon Marshall on your team), or on the hockey rink (having Jonathan Toews, Patrick Kane, and Corey Crawford at the heart of your team. 4) It made “tunneling” by opposing armies impossible (or at least impractical). As investors in the 21st century, we can benefit from the ETF industry, which specializes in transforming almost any strategy into an easily purchased fund. The folks at Morningstar get credit for being the ones to research and perfect an “index” that incarnates the principles of stock selection based on castle moat imagery. Morningstar’s proprietary methodology enables its analysts to discern which companies earn sustainable (ala Napoleon) profits from its invested capital that are great enough (relative to its cost of capital) to be considered superior (compared to competitors). 1) A company in an industry with “high switching costs”. An example would include Express Scripts (ESRX), which has a huge network of customers for which it provides mail order pharmacy services and processes prescription drug claims. The size of its network (and the systems and infrastructure required to be a low cost leader) makes it as difficult for a start-up to compete with it as it was for an enemy to storm a moated castle. 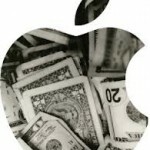 In contrast, no matter how much we may esteem Apple, Inc. (AAPL), we have seen how easy it has been for Samsung and Android to grab the lion’s share of the smartphone market. 2) A company has a “cost advantage”. Those who witnessed (and studied) the meteoric rise of Walmart (WMT) from diminutive Rogers, Arkansas to the world’s biggest retailer know that it did so based on its singular and unswerving mission “to be the low cost provider” and its investment in IT infrastructure that drove the industry’s most efficient supply chain. I may hate the WMT “shopping experience” in its stores, but I love the price. 3) A company that has high-value “intangible assets”—whether they be patents, brand recognition, or government favor. Yes, government favor! Just ask Bidu (BIDU) or Sina (SINA) how important government support or meddling can be in its success (they’ve experienced both). Brand recognition is easy – what do you think of when you need a book or a DVD? (Yes, Amazon (AMZN).) And patents are the sole reason that Google (GOOG) found Motorola Mobility worth buying! That screening and analysis results in one of three “rankings” for each stock: 1) “No Moat”; 2) “Narrow Moat”; 3) “Wide Moat”. 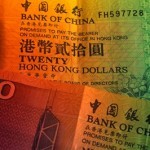 The next step applies a standardized, proprietary valuation model. The “forward-looking model” calculates a “discounted free cash flow” figure for each of three time periods: 1) first five years; 2) year six to “perpetuity”; and 3) “perpetuity”. The sum of those three numbers is considered “Enterprise Value” (EV). From that “EV” number, analysts subtract debt and adjust for any off-balance sheet assets or liabilities to determine “Fair Value” (FV). The objective of this process is to discern companies with an above average “return on invested capital” (ROIC) that is sustainable for at least 20 years! 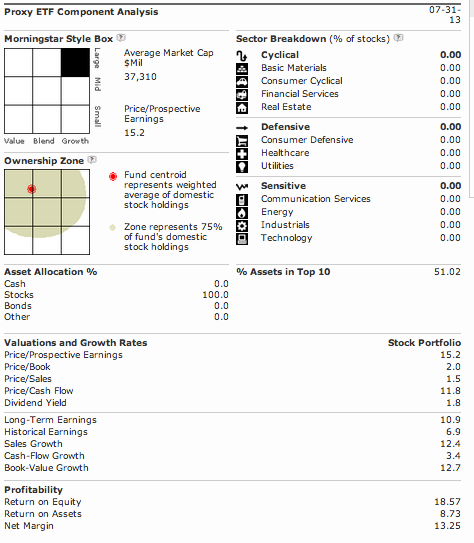 This Morningstar index was first incarnated in the form of a publically available security in October of 2007: Elements Morningstar Wide Moat Focus Total Return ETN (WMW). It is fair to say that the security did not “sell like hotcakes”. In fact, it is safe to say its profile/market visibility remained low. 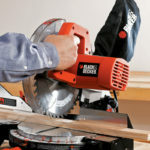 There are several factors that came into play to account for the dearth of popular interest in this product: 1) it was introduced at a bad time; 2) it is an ETN (sponsored by Deutsche Bank AG), and therefore a debt instrument instead of a fund of stocks; 3) it charged a 75 basis point expense fee. Over one year ago (April 24, 2012) the “Van Eck” investment management firm stepped up to create, operate, promote, and market a separate iteration of the Wide Moat Index. This offering, Market Vectors Wide Moat ETF (MOAT), is an ETF (a fund of stocks), with a lower expense fee (subsidized by Van Eck so it is only 49 basis points). Obviously, the sponsor has a larger budget and market channel through which to motivate sales. In fact, through the first five months of this year, MOAT was one of the hottest “boutique” ETFs, pulling in over $100 million. 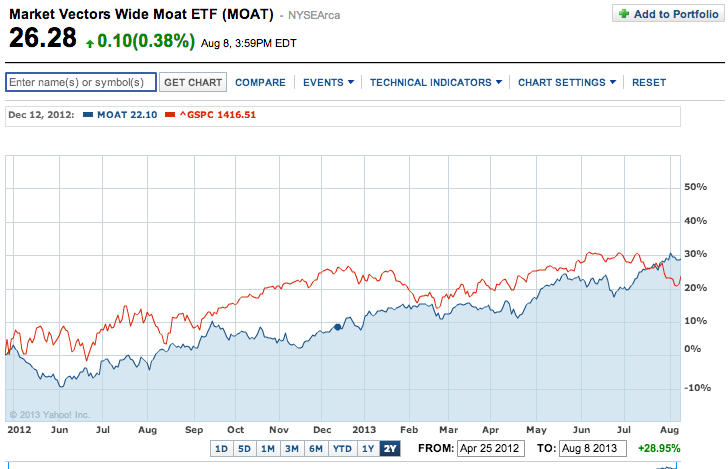 The current size of the MOAT portfolio is almost $290 million and the reported SEC yield is 1.15%. Anyone who buys MOAT needs to be aware that, as a part of its “active management”, portfolio components are periodically adjusted, most often based on relative value. This increases portfolio transaction costs, but also more effectively maintains the metrics that are intended to drive performance. For example, take a peek at the screenshot from the MOAT website that I included in my “appendix” at the end. 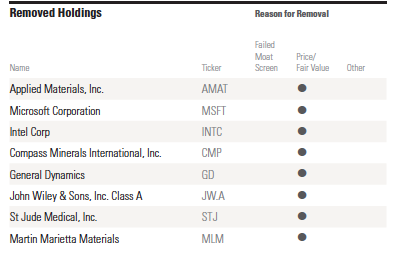 After an extended period of outperformance by MOAT stocks Microsoft (MSFT) and Intel (INTC), MOAT managers sold them (along with General Dynamics (GD), Applied Materials (AMAT), John Wiley & Sons (JW-A), St. Jude Medical (STJ), Martin Marietta (MLM), Compass Minerals Int’l (CMP)—as you can see) and replaced them with eight new stocks – most notably including Facebook (FB). [See below]. 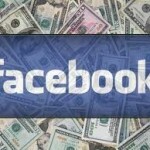 I emphasize the addition of FB toward the end of June because that portfolio change proved to be remarkably prescient! You’ve already had the opportunity to read why I had to “eat my hat” because of FB. “Blow Out” was an understatement by my editor with regard to just how much the magnitude of FB’s earnings report caught Wall Street by surprise!! 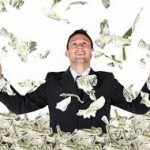 [See: https://www.markettamer.com/blog/facebook-blows-out-earnings-now-what-2]. Recall that the “ideal” weighting in MOAT is 5% per stock, and notice that FB (on August 7) constituted almost 8% of MOAT!! That is huge! At June 21st, Western Union (WU) was priced at the biggest discount to Fair Value (.68), rapidly followed by FB (.70) – precisely why the MOAT folks switched out MSFT, INTC, etc. for FB and the others!! I needn’t tell you that FB is no longer toward the top of this list that measures discount to “Fair Value”!!! To provide a more “balanced” view, take a look at a 24-month chart of the same. 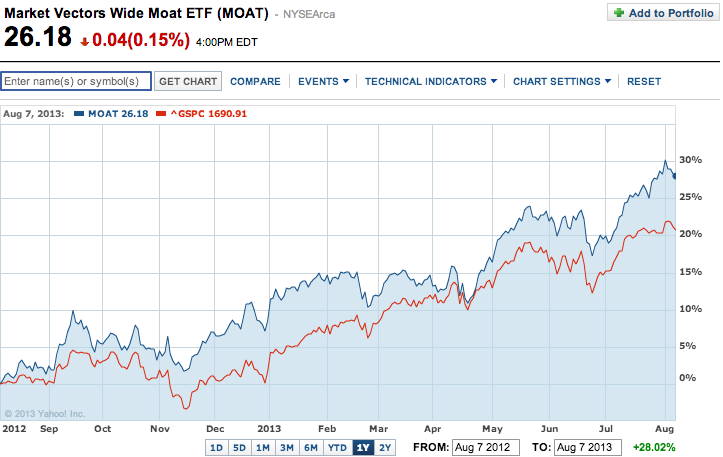 Realistically, MOAT will outperform the S&P 500 during some periods and under perform during other periods! 1) Note the prominence of Berkshire Hathaway (BRK-B) in the MOAT portfolio – yes, the “Oracle” practices what he preaches!!!! 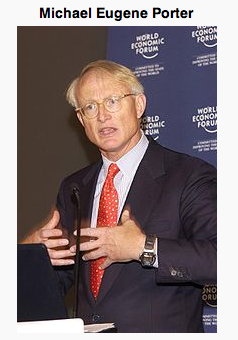 2) No article about competitive advantage would be complete without reference to Michael E Porter, who will forever be associated with his most popular works in the field, including Competitive Advantage, Free Press, 1985) and “The Five Competitive Forces That Shape Strategy” (Harvard Business Review, January 2008, pp. 79–93.). DISCLOSURE: The author currently owns MSFT options. Nothing in this article is intended as a recommendation to buy or sell anything. Always consult with your financial advisor regarding changes in your portfolio – either subtractions or additions. 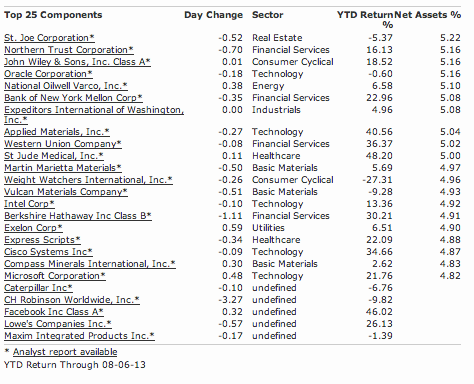 Below is an expanded list of “MOAT” stocks as of August 6th. Obviously, not all of them are currently in the portfolio! Yes, I am a proud Chicago Blackhawks fan! As history buffs know, the Plantagenets were the most prolific builders of castles surrounded by a moat. LNKD has become so successful that it is now the de rigueur tool for seeking employees or finding employment. And here you thought they might not be serious about “sustainable”! This model is a variation on Ben Graham’s valuation discipline. Obviously, market price movements change the weightings daily. Morningstar reports that the annualized five year performance of the Wide Moat Index vis-à-vis the S&P 500 Index (assuming dividends are included in each case) from August, 2007 through July 2012 was: MOAT 7.4% vs S&P 1.1%. Looking back, they would have preferred a more favorable market environment for its “birth”.